These are the 11 people arrested after the international anti-drug operation in Ecuador and Greece. 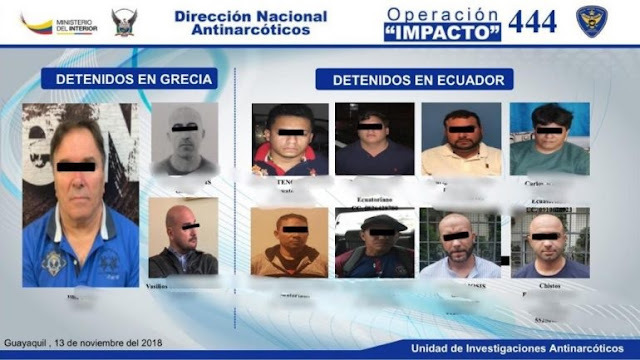 Thanks to this operation, 8 citizens were arrested in Ecuador and 3 in Greece, among them an Albanian, who is considered the head of the organization along with two Greeks. Oculus News sources suggest that the Albanian arrested in Greece is Ilia Petro Papa and was born on 04.12.1977 in Elbasan while living in Athens. The Albanian is with penal precedent as he was previously arrested in Italy for the trafficking of 200 kg of marijuana. The operation took place on the evening of November 13 and the first hours of November 14. About 300 kg of cocaine were seized in a sailing vessel with the destination in Australia destination. It is said that most of the drug would be uploaded there, and the rest in Greece. Meanwhile Greek media report that cocaine seized during the international operation in Ecuador was commissioned by the Albanian mafia.